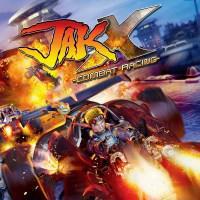 A spinoff that expands the dune buggy gameplay from Jak 3 into a full game. Despite using the same characters and continuing the story and worldbuilding where it left off, this isn’t really the same kind of game as its predecessors. As implied by the title, you’re now spending all your time racing and engaging in vehicular combat. While the combat racing gameplay is polished, the series’s trademark variety is lacking and there is no platforming at all. If the dune buggies were your favorite part of Jak 3 , you’ll enjoy the expanded and improved version on display here; otherwise, you may be disappointed. I loved the previous three games and was hoping the racing would be entertaining enough to enable me to spend more time with these characters. But I’m not really into driving games, so for me it wasn’t. The game seemed well put-together and I’d encourage Jak fans who do enjoy driving games to check it out. Other Jak fans might want to just watch the cutscenes. I Stopped Playing When: I played for an hour or two but couldn’t get into it.